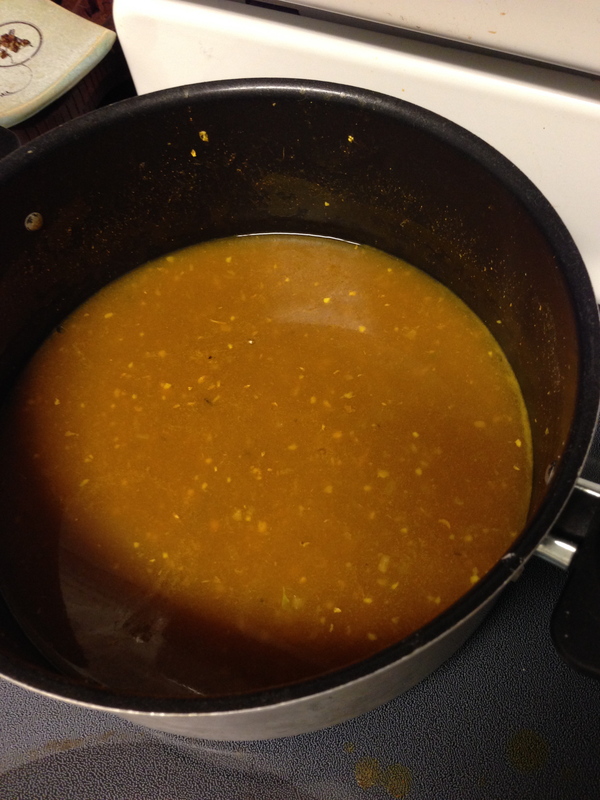 This recipe was an attempt to make an AIP-friendly sauce for hot pot. So far, I’ve used this sauce to cook bok choy, nappa cabbage, shrimp, lamb, and sweet potatoes. All of these have tasted wonderful. This sauce is as close to curry as I’ve been able to get for a while. See, I love spicy food. And curry. Especially spicy curry. However, about 6 months ago, due to circumstances beyond my control, I found that I could not eat spicy food (or a lot of other foods, for that matter). Long story short, I’ve come a long way in adding food back into my diet, but I’m still on a hybrid anti-inflammatory/autoimmune/whatever-doesn’t-hurt-my-stomach-and-give-me-heartburn diet. Heat on medium and stir until the tapioca flour is dissolved. When the sauce starts to simmer add the meat and vegetables along with the cilantro and green onions. These picture, I just used some sweet potatoes cut into wedges and then again into thirds as they cooked. Lamb was still my favorite meat. This is also a great sauce for nappa cabbage and bok choy. Simmer/low boil until the meat and vegetables are cooked. I would recommend adding the potatoes first. The potatoes took about 15 minutes to cook. After about 5 minutes, I added the meat. The cabbage only needs about 5 minutes to cook, so I might add it slightly before the potatoes are done. – The sauce gets thicker the longer it simmers. – This sauce is enough to cook about 2 1/2 large sweet potatoes. – Do not cook carrots in this. The sweetness of the carrots did not mingle well with the flavors. – I imagine cauliflower would taste good with this sauce. We’re not on speaking terms, presently, though, so I don’t know for sure. Add the cilantro and potatoes. I ran out of green onions for this batch… and I missed them. 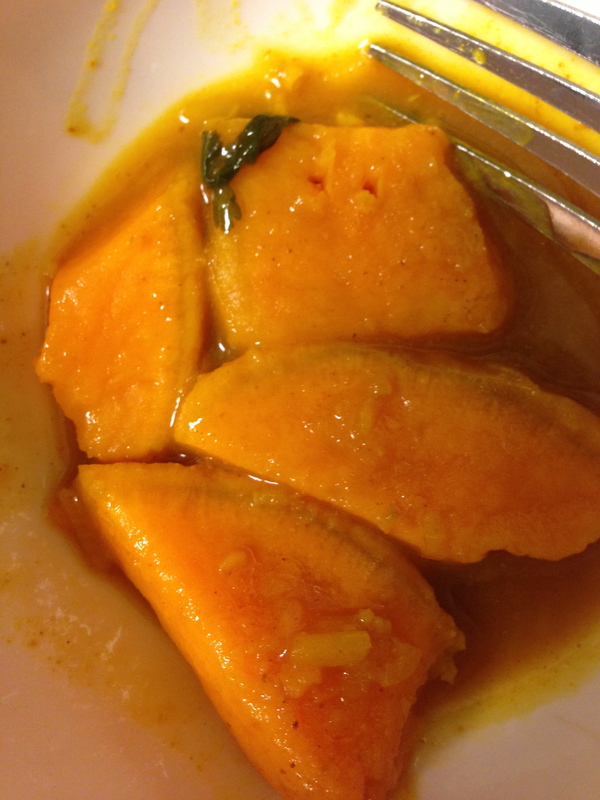 “Curried” sweet potatoes. Comfort food, right here. 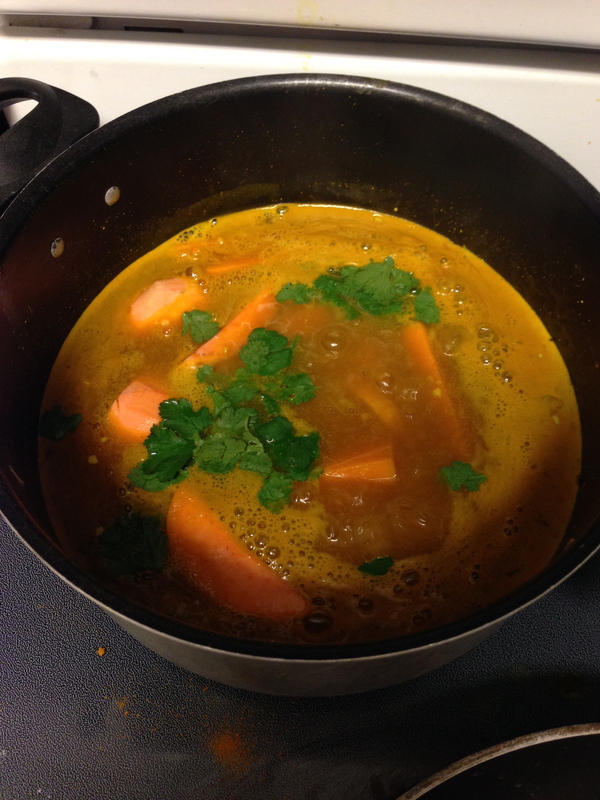 Posted on February 13, 2015 by Katie •	This entry was posted in Cooking Adventures, Lactose-free Cooking and tagged aip, antiinflammatory, autoimmune, cooking, dairy-free, egg free, gluten free, nut free, soy-free. Bookmark the permalink.